In Kissimmee, street safety is taken very seriously, and so it should be. We depend on everyone on the road to drive just as safely as we do, for the sake of our loved ones and our friends. Unfortunately, there’s only so much we can do, usually, to enforce these safe driving practices. Police and parents can’t be everywhere all the time, to ensure that people are obeying traffic laws and complying with best safety practices. The 2018 Fiesta has a new solution for this problem, with their MyKey system, which can be programmed to limit maximum speeds, enforce seat belts and govern audio level limits. This alongside a fantastic cold weather package, a hill start assist system, and an intelligent rear-view camera with UI and depth perception, and this vehicle is as safe as a vehicle can get. 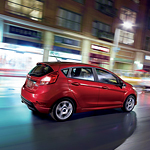 To experience the 2018 Ford Fiesta’s safety features yourself, visit us at Mullinax Ford of Kissimmee today for a test drive.